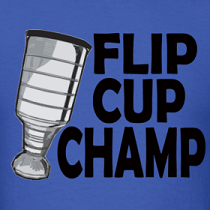 Dirty Dangle Hockey: Does Brian Elliott Get A Vezina Nomination? Does Brian Elliott Get A Vezina Nomination? These are some impressive stats. 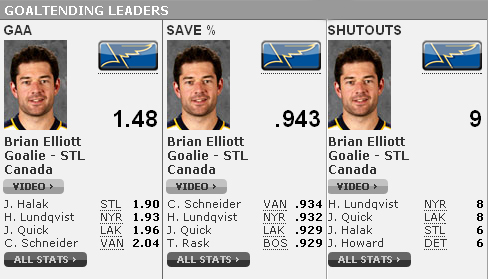 Brian Elliott has a 0.42 GAA lead on his goaltending partner, Jaroslav Halak, and a .009 SV% lead over Cory Schneider. His 9 shutouts lead the NHL, but Brian Elliott has only appeared in 36 games this season. While his stats are phenomenonal, he's only started 34 games, and is that enough starts to earn him a chance at winning the Vezina Trophy for best goaltender in the league? While he and Halak are locks for the William M. Jennings Trophy for the fewest goals allowed this NHL season and Elliott barring a meltdown will take home the Roger Crozier Saving Grace Award, it's up in the air as to whether either goalie deserves a nomination for the Vezina Trophy due to them splitting the goaltending duties for the league leading St. Louis Blues. But looking at Elliott's statistics this season, you have to give him the nod over Halak if you are going to nominate a goaltender from the Blues. His goals against average is currently the 14th best all-time in the NHL, however most of those in front of him on that list played in the late 1920s when low-scoring was quite common with quirky rules. His .943 SV% is currently the best recorded save percentage of all-time, currently bettering Tim Thomas' record season last year by .005 percentage points. His 9 shutouts are up there with with some of the best in modern-times (Hasek's 13, Brodeur's 12, and Lundqvist's 11), despite playing in almost half as many games. Are these numbers good enough despite the fact that Elliott won't play more than 40 games this season? Keep in mind Elliott hasn't just played against the weaker teams in the league, he's been the Blues go-to goalie against top teams like the Red Wings and Canucks, and helped keep the ship afloat when the Blues struggled early on in the season under Davis Payne. Since taking over in early November, the Blues have gone 42-13-9 under Hitchcock. Sure they play a defensive game and allow the fewest shots in the league which are clearly shown in their goaltending stats, but is playing under-40 games enough consideration for a major trophy nomination? What do you think? Does Brian Elliott deserve a Vezina nomination? I was actually just looking at his stats and asking myself the same question the other day. Honestly I think he deserves a nomination for sure. I mean, you have to give the award to Lundqvist this year hands down, but Elliot most certainly deserves to be nominated. I'd say nominees should be: Elliot, Lundqvist, Quick. Lundqvist and Quick are locks to get nominated. But the 3rd is wide open in my opinion. Rinne's stats are good, same with Fleurys. Mike Smith deserves some consideration too... I don't think Elliott or Halak have played enough games. Elliott has some crazy stats for a guy that couldn't stop a beach ball last season. If this was the MLB we would all be saying he was on roids.